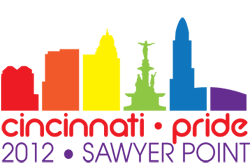 Since the first gay pride celebration in Cincinnati in April 1973, Pride parades have been lead by Pride marshals. As the following list of former honorees suggests, the group is diverse, talented and truly reflects the diversity that is the Cincinnati area. Here is a brief recap of the former Pride Marshals over the years, in alphabetical order. Karen Aronoff-Holtmeier: Worker for equality, locally, regionally and nationally through her efforts with the former One Human Family and her subsequent work on the HRC Greater Cincinnati Steering committee. Phebe (Karen) Beiser: Retired Librarian, activist, writer, founder of Ohio Lesbian Archives, in leadership with Women's Way and Women Writing for (a) Change. Randy Bridges: Tireless promoter and fundraiser for various Cincinnati charitable causes. He was one of the first to do HIV benefits in the early 80s. Stop in some day at the On Broadway, and you might just find Randy there. Doris Marks Callis: She is currently General Manager of the gay-friendly Glendalia Boutique Hotel in Glendale, Ohio. She teaches hospitality and tourism at Antonelli College downtown, as well as, being involved in various fundraisers. A friend of pets, she is active in dog rescue groups. Yet, Doris finds time to travel to New York, South Beach, Austin, Barcelona, and other spots. Doris also represents Karen Lindner Designs in new accounts and publicity, for her one of a kind jewelry made with antiques. Michael Chanak: P&G (Retired thankfully) Employee advocate/activist for Gay/Lesbian inclusion in Equal Employment Policy (1985 - 1992), division diversity facilitator; corporate adviser on HIV issues and gay community, published writer, journalist, publicist and broadcaster; GLBT News Associate editor; Board Member GLBT Community Center, with 30 years GLBT Cincinnati volunteer involvement. He has countless children and grandchildren. Michael Cottrell: Currently works for a mobile medical company and is the president of PFLAG Greater Cincinnati (Parents, Families & Friends of Lesbians and Gays). Additionally, he is on the Board of Stop AIDS and is active with ISQCCBE (Imperial Sovereign Queen City Court of the Buckeye Empire All of Ohio, Inc.) raising money for local non-profit organizations in Cincinnati and NKy area. David Crowley (Deceased): David was a former Cincinnati council member and Vice - Mayor. A tireless fighter for equality, David on his first day as a councilperson became the leading voice for repealing Article 12. Voters agreed and repealed the anti-equality article in 2004. Michael E. Dorobek (Deceased): Former manager/bartender at The Dock, long time community fundraiser for many causes, notably HIV/AIDS. Cheryl Eagleson, Marketing Director, The Corporation for Findlay Market, past President of Queen City Careers Association and first President of the Gay Chamber.Vice president of the Board of Caracole, Inc., producer of Alternating Currents GLBT Radio Show, WVQC lpfm, WVQC Radio Advisory Committee at Media Bridges, Cincinnati FBI Multi-Cultural Advisory Committee, Board member FBI Citizens Academy Foundation - Cincinnati, Ohio. Patti Herrman: Activist, and organizer most recently taking a lead role in establishing Northern Kentucky Pride (beginning 2010). She is a former Gay Lesbian Coalition President and spent years advocating and raising funds for people with AIDS. Scott Knox: Sole practitioner in firm handling mainly GLBT issues, probate, and disability cases; Board member and Secretary of Strategies to End Homelessness; Board member of Equality Cincinnati and Equality Cincinnati PAC; Board member of the Cincinnati Citizens Complaint Authority; member Pro Bono Task Force Committee, 1st Judicial District, member Volunteer Lawyers for the Poor; lecturer on LGBT and HIV legal issues. Kathy Laufman: Kathy has 17 years of leadership experience with GLSEN Greater Cincinnati (Gay, Lesbian and Straight Education Network) and a current co-chair. She is a straight ally, youth advocate, community activist, and grandmother. Rusty Lockett, President of the Greater Cincinnati Gay Lesbian Community and chair of the ever-popular Pride Nights at Kings Island (September 7, 2012). His other activities include work with the Episcopal Church including the National Episcopal AIDS Coalition, and QNation.FM. John Maddux: Associate Professor of English at UC, published writer, activist, volunteer in community for 25 years, current Vice President of the GLBT Community Center, former three year Coalition president. Scott McCarty: Media coordinator for the Green Party of the United States and the DC Statehood Green Party, living in Washington, DC. Megan Neal, MSW/LSW: Co-facilitator of GLBT group at GLBT Center, Case Manager at Necco - Therapeutic Foster Care/Independent Living, Social Worker at Lighthouse Youth Services and president of the QCRB (Queen City Rainbow Band). Vic Ramstetter: Published writer, co-founder of the Ohio Lesbian Archives. She is well known in the women’s community as both a resource and trainer/presenter on lesbian history. Worley Rodehaver: Publisher of two newspapers, the Greater Cincinnati GLBT News, and METRO Neighbors/Northside. He is the recipient of the NKy PRIDE Jim Kippenberg Journalism Award for his commitment to publishing news about the GLBT Community. Ronn Rucker: Retired from Cincinnati Health Department, he is credited with two others (Dr. Evelyn Hess and the late Michael Ritchey) for establishing Cincinnati’s response to the combat and educate about HIV. He and his life partners, Ruth and Les live in North Bend. He intends to live long enough to see Chris Seelbach as first gay governor of the State of Ohio. Ronn is a member of Church of Our Saviour in Mt. Auburn. Peter A. Thompson “Peaches LaVerne”, Deceased, internationally know and locally loved as the long-standing hostess of the old Subway Bar. Billed as the regions oldest female illusionists and was a beacon of pride and courage. Shane Que Hee: Professor of Environmental Health Sciences, UCLA; Facilitator, Out Against War; Facilitator, LA LGBT Greens. Marian Weage: She is 2008 Graduate of NKU in Musical Theatre Performance, working as an actor, church secretary, organist and choir director, continuing to speak at universities, churches, schools, corporations, etc. on diversity. Marian and two others (Todd Kamm & Ron Mohring) were the founders of PFLAG Greater Cincinnati in 1985. Larry Wolf: Retired from University of Cincinnati. Educator, published author and long term activist. Larry is a World War II veteran resides in Clifton. It is a long and rich history. Kudos to Bruce Beisner, formerly of the GLBT News, Michael Chanak and Phebe Beiser for the research and time needed to capture this information.